For Jan. 21st JAXA has posted 3,062,611 km2 for SIE around Antarctica. For Jan. 22nd JAXA has posted 2,981,476 km2 for SIE around Antarctica. Of the 10 choices on the poll for SIE 2017 minimum, 5 of them have already passed and it's only January 22nd! Of the 64 forum votes, 62 were for 2.75m or less, so most people are still in with a chance. Also worth noting that there's still a fair amount of extent to lose in/near the Ross sea, which was previously flagged as vulnerable. I think the chances of a record low are looking very strong now; it's really more a question of how much of a record. EDIT: Does anyone have a link to comparative sea surface temperature / other melting condition data for the southern ocean to better inform our guesswork here? There is a hot spot just off Weddell Sea that may have an influence. 2nd image is a forecast for sea ice thickness for Feb. 1st, but gives an idea of extent also. My lazy layman's best guess (I don't try to crunch data, I just click on alot of EOSDIS) is that the difference between low and a record low depends on what happens with the stretch of ice running from the Bellinghausen Sea to the Thwaites glacier. Generally speaking the ice is mobile and has been pushed out off of the coast. The remaining areas of fast ice are relatively exposed (don't have loose ice against them). These are conducive to melting. Conversely, some of the ice is thicker than other areas and thus not conducive to melting out. For Jan. 23rd JAXA has posted 2,924,396 km2 for SIE around Antarctica. According to NSIDC, the SIE aound Antarctica was 2,899 Mn km2 for Jan 23. Down by 128K. For Jan. 24th JAXA has posted 2,840,868 km2 for SIE around Antarctica. At an average daily melt of 50K, the remaining ice will be approaching 1.5M by February 20. 2017 has been melting at a faster rate than 1997 even this late into the melt season. If we were to use 1997 numbers to finish out this melt season, 2017 minimum would be 1.65M km2. As of 1/24 we are 600K km2 ahead of 1997. * The current map of the ice. * The ice map at the same date in 1997. * The ice map during min in 1997. Alternatively, extent numbers for the various Antarctic regions on those dates. This will enable an informed prediction of this year's outcome. Note: Apologies for not posting the same myself, I am quite illiterate when analyzing Antarctic sea ice. Imho, we're nearing bottom for the year now. Not much left to lose in the Ross sea, and the other regions (a) are only falling slowly and (b) only have relatively secure fast ice remaining. I certainly don't expect that extent will fall below 2 million. "To predict the behavior of ordinary people in advance, you only have to assume that they will always try to escape a disagreeable situation with the smallest possible expenditure of intelligence." Comparing the previous minimum with the current SIE (NSIDC numbers) reveals that to reach the 1997 minimum at 2,29 Mn km2 (5-day average) we need to lose another 721K. Not impossible but not an easy task either given that most of the "easy" ice is gone now and most of the remaining one is fairly thick. However, there is one region that I believe will determine the final outcome. The sea ice in the Somov Sea east of Ross Sea seems to be fairly thin according to Copernicus and should take a decent damage until the beginning of February. The tricky thing is that the model have foreseen this scenario for a while now but the sea ice there have so far been very stubbornish and resistant and also seems to lack melting momentum. If significant melting is to occurr then I think we might reach a new record low minimum. If not, we should clearly be among the five lowest minimums by the middle of February. The Coast Guard says that in previous years Polar Star typically worked through approximately 12 to 13 miles of ice to reach McMurdo Station. This year, however, there was more than 60 miles of ice to break with thickness ranging from two feet to more than 10 feet. For Jan. 25th JAXA has posted 2,761,228 km2 for SIE around Antarctica. Seems to be an interesting debate developing re the 2017 low for SIE. Those that are using trend lines from past years as a basis for their estimates (frankendoodle and budmantis) tend to be predicting a new low. Those that are taking a granular view based on a sea by sea review (Lord M Vader and Paddy) seem much more skeptical about a new record low being set. This is a little odd, but I may be able to square the circle to a degree. The article never said the ice was thicker than normal, only that it was between 2 and 10ft in thickness (0.6 to 3 metres). As maps from the time show (http://forum.arctic-sea-ice.net/index.php/topic,1759.msg99392.html#msg99392), there was a wide area of ice a considerable distance offshore in the Ross sea (looking a bit like a rocking horse in the images in the linked post). It's this very area which has since been vanishing from the map, being low thickness and not fast to shore. It's possible most of the ice met by this icebreaker may have been towards the 2 foot end of the range - it doesn't look particularly thick in the linked images. I actually think a new record low could happen, just not one below 2 million. But I am expecting the daily drops to reduce quite a lot now the Ross and Amundsen seas have basically melted out. Thanks Magnamentis! I was thinking of changing my signature line, but after your feedback, I think I'll keep it. Apologies to thread for off-topic discussion. Hello C.C. : I don't know much about the Antarctic and have little observational knowledge. As a result, I have little choice but to use trend lines. As previously stated, it looks like a minimum of 1.5m is certainly possible, but as to the final number, I'll leave that to those who know more about the subject. I'm no expert either, but I'm sticking to my prediction of a slowdown in the melt. If I was to predict hard figures, I'd guess that JAXA extent will bottom out at about 2.3 million square km (+/- 0.2 million). But it really all depends on what happens in the Weddell  and Belingshausen now. If you check out the MODIS image of Ross Island for the 18th you can see the scar in the fast ice that the ice breaker made. I too found it a bit odd that they had such a torrid time this year so checked the images and , Yes!, Ross sea was near ice free but the base is on the landward side of Ross Island and the 'bay' to access it is frozen solid. From the images from the 19th the fast ice began to collapse. The report talks about ice under pressure so I wonder if there activities destabilised the ice ( broke it and so reduced the stresses?) on their trip? I bet they wish they's waited a couple of days though! i hold the bet while anything between 1.95 and 2.05 is arbitrary, still we fall continuously an are only 8 days away a the current rate which i, like you don't expect to continue for that period but then another 3 or 4 days above -60k per day and we get so close that we gonna make it for almost sure. It was my surprise at the 60 km vs 12/13 km normally that struck me. I suspect they would have avoided the "rocking horse" which anyway shows as typically < 50%, so not very solid. It's coming soon. As you'll see from the regional breakdown, the most rapid drop in ice has been in the Ross sea, and there's almost nothing left to melt there now. As I have pointed out, the Somov Sea will determine the final outcome of this melting season. Another area that will determine the outcome is East Antarctica where the the extent numbers have been fairly normal. For today, NSIDC reports a SIE of 2,726 Mn km2. This means that we "only" need to lose less than 500K to reach the single lowest daily minimum value from 1997 at 2,264 Mn km2. CC_Reanalyzer shows that the next 5 days will be warmer than normal in the area of Somov Sea and Weddell Sea. This should do at least some damage to the ice in Somov Sea. Another area that will determine the outcome is East Antarctica where the the extent numbers have been fairly normal. This area tracks as usual,but normally it lose about one third of the remaining extent by the annual minimum. 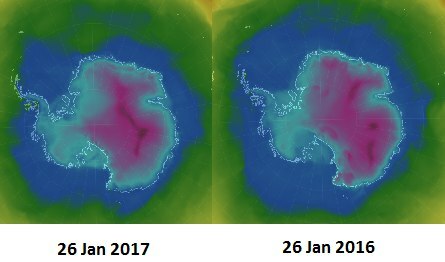 As you can see in the image, much of heat have been accumulated around Antarctica and the melting momentum in February could be longer and stronger. Jan 4th--Sea Ice melt is lagging previous year. Large area of loose ice on top of a substantial and long bank of fast ice. However, note the polynya in the two bays at the right of the shot and in the large bay at the center (Lutzow-Holm Bay). These don't seem to usual occurrences. Jan 22nd--A multi-day storm has pushed off much of the loose ice counterclockwise (west) and away from the bank of fast ice. However, some loose ice has been pushed against the fast ice and has actually increased the area of fast ice. Extent is lower than on the 4th, but not necessarily conducive to further melting. Note that the twin bays at the right have experienced considerable fracturing and in fact are now more advanced than the previous year, probably thanks to the polynyas. Also, note that the polynya in Lutzow-Holm has continued to grow. Despite the break down of the twin bays, overall melt continues to lag the previous year as the fast ice remains much more substantial. Jan 26th--Winds have totally reversed and are now pushing ice off of the coast. Not only has the newly fastened ice broken off, but large chunks of previously fast ice have broken or eroded. While the extent may actually have grown in the region slightly, the potential for melt is now greater. While the polynya in Lutzow-Holm is obscured by clouds, the breakdown of the twin bays continues and if you zoom in you can note a substantial calving of whatever glacier occupies the west bay. Melt and breakup of the fast ice still lags last year but the polynya in Lutzow-Holm seems to be a potential x-factor. If it continues to erode the fast ice from the back, while the front side continues to erode, it could be repeat of what happened with the twin bays and breakup/melt of the region could actually exceed last year. As always weather and winds will matter. For Jan. 26th JAXA has posted 2,706,165 km2 for SIE around Antarctica. Besides the fast ice off of Enderby, areas of fast ice that are currently breaking down include the stretch between the Ross and Amudsen Sea, McMurdo Bay the Ronne entrance in the Bellinghausen, probably Marguerite Bay in the Bellinghausen (cloud cover) and several small areas along the Coronation. The stretch of fast ice from the Somov to Davis has been stable with minor erosion. Of course, just because fast ice breaks up, doesn't mean it will melt out. The stretch between tho Ross and Amudsen is the most surprising to me as it was pretty low to begin with. I was wondering how susceptible the ice is in the Weddell Sea. Most members think the daily melt numbers will drop as we near the end of the melt season and that certainly could be the case. I thought what Pavel and Dingojoe said in their most recent posts was informative. How much more melt can be expected from that area, which by the way has the largest percentage of remaining ice. Most of the weddell Sea ice is not very thick. I don't think warm air will melt much. Insolation, is probably about to be on the way out. There is a decent size area of warm water nearby, and maybe if the right storm came along and stirred the water up, anything's possible. note the polynya in the two bays at the right of the shot and in the large bay at the center (Lutzow-Holm Bay). These don't seem to usual occurrences. There has been what looks like upwelling to the right against the land mass growing bigger since November with what appears to be under cutting by current all the way to open ocean. Only a very small drop today, down 24K. The 5-day average OTOH dropped more sigificantly (84K) and is now down to 2,839 Mn km2. "Only" 549K more until record low minimum... But OTOH there is not much ice left to melt out. So I've done some number crunching using the NSIDC links Wipneus was kind to provide (I should have had them already), in order to arrive at some better extrapolation of Antarctic SIE at the minimum, based on regional historical data. I am using NSIDC data for Jan 26 as current date. On current date 1997 had a total extent of 3279k, declining to 2264k at minimum on Feb 27. Regional minima occurred within several days of each other, notably wedd started growing about a week before the general minimum. Had all minima improbably occurred on the same day, the total minimum would have been 2125k. Currently, for Jan 26, 2017 has a total extent of 2702k, or about 576k less than 1997. Extrapolating the total naively using the 1997 decline to minimum would give 1688k for this year. The real shocker is ross, which by itself explains the whole difference between the years and is totally unprecedented. Previous lowest for the date was 424k. * wedd – looking at the five lowest years for the current date with 919k to 1,130k, three declined 223k-246k to Feb 27, one declined 126k, and one actually grew by 101k (but declined 120k to that year's minimum which came about much earlier). 1997 also declined 115k. Note: timing of wedd minimum vs. total minimum can make a major difference in the outcome. ** ross – any-date minimum was 124k and we are already at 132k. 1997's 313k decline is impossible. Looking at the ten lowest ross years for this date (424k-712k), averaging their decline to Feb 27 gives us about 200k, still impossible. So it's either almost nothing 30k or almost everything 100k, anyone who can analyze actual ross ice situation is warmly welcome to comment. Can it go to zero? *** The above can be improved for wedd and ross by checking each year's decline to its own minimum date, instead of using Feb 27 for all. The above can be improved for all regions by looking at other similar years and averaging their declines to minimum instead of just using 1997. Following this statistical guesswork, I think <2m has a much higher probability than >2m. For Jan. 27th JAXA has posted 2,627,832 km2 for SIE around Antarctica. Interesting and thorough analysis, but summing the different declines to minimum by sea assumes they'll all be at minimum on the same date. And although we'd expect them all to hit minimum around the end of Feb based on previous years, there's also likely to be a fair bit of individual variation, especially with ice in Bellingshausen and Weddell extending further north than the others this year, so likely switching from melt to freeze a few days later. Oren can you repeat that analysis excluding Ross ? That ice is gone and will not play a role for the approach to the minimum from now on.